I feel like I've been on a film review hiatus for a long time - it's not that I haven't been watching movies, it's just that I haven't been watching any that I really wanted to put up on the site. I mean, does anyone care to read yet another missive about Dr. Manhattan's dong? 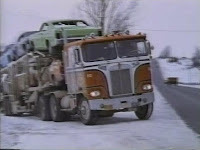 I broke out of my rut last night when I popped in High-Ballin', a US-Canadian co-production from the late '70s about a group of big-rig highjackers terrorizing the highways of what looks like southern Ontario, and the plucky pair of truckers who try to put an end to their reign of terror. Peter Fonda and Jerry Reed play Rane and Duke, the American imports in a cast otherwise comprised of mostly Canadian faces, including Helen Shaver as Fonda's tough-chick love interest (her name is Pickup, how adorable), Videodrome's Les Carlson, and Chris Wiggins, among many others. The trucker lingo is near-incomprehensible at times but it's fun to watch Shaver and Fonda flirt via CB radio nonetheless. Filmed somewhere between the desolate landscapes of Milton and the snowy tundra of Toronto's waterfront, High-Ballin' starts out as a buddy movie, reuniting family man Duke with his roaming old pal Rane, a former trucker who's given up the life for a motorcycle and the open road. By the final third however, it becomes a sort of Canadian Convoy (which also came out in '78) with Fonda and Shaver in the Kris Kristofferson and Ali McGraw roles, uniting the truckers against a corrupt threat to their independence and way of life (though Shaver is undeniably tougher than McGraw). Some terrific chase sequences and highway shootouts ensue. Incidentally, director Peter Carter was also responsible for the Canadian classic The Rowdyman, which was written by and stars a young Gordon Pinsent. A beautiful example of what was quite a popular genre in '60s-70s English Canadian cinema: the story of an outsider from the east coast trying to come to terms with his environment.